3-D geometrical modelling and solar radiation at urban scale - morphological or typological digital mock-ups? CISBAT 2013 - International Conference. Cleantech For Smart Cities & Buildings. From Nano to Urban Scale. Studies regarding solar energy at the neighbourhood scale always have to deal with the size and the complex geometry of a real built context. Three-dimensional modelling techniques allow visual reproduction of formal features and solar performance of a city portion. Nevertheless, the definition of the right level of detail (LOD) is always a crucial point when creating digital mock-ups. On the one hand, currently available computational resources are not totally able to suport the exact representation of a building cluster and the simulation of environmental phenomena is often based on parametrical analyses. On the other hand, a drastic geometrical abstraction could discard important information and affect the reliability of solar predictions. This study aims to identify the most suitable LOD to simulate the solar performance at the mesoscale of the city. To do this, the direct radiation access within a building cluster is assessed by employing virtual models with different approximation degrees. This comparison allows assessing the margin of error between different levels of detail and discussing about benefits and inconveniences of the two approaches. The results might be elaborated to define a rank of deviation factors, useful to evaluate the margin of error provided by generic models with regard to solar predictions. 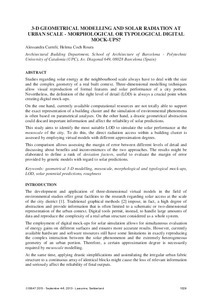 Curreli, A.; Coch, H. 3-D geometrical modelling and solar radiation at urban scale - morphological or typological digital mock-ups?. A: CISBAT International Conference Cycle. "CISBAT 2013 - International Conference. Cleantech For Smart Cities & Buildings. From Nano to Urban Scale.". Lausanne: 2013, p. 1029-1034.